I've shared my Super Smoothie Recipe before, but I want to share another smoothie that I make that is an absolute treat. The amount of almond milk you use depends on the consistency you want. You can use less, and get almost a matcha green tea banana ice cream, or use more to get a regular smoothie consistency. I would start with 1/4 cup and add little by little from there. Usually about a half cup is good. I use PLAIN almond milk for this. The bananas make it perfectly sweet, vanilla almond milk would make it too sweet for my liking. There you have it. 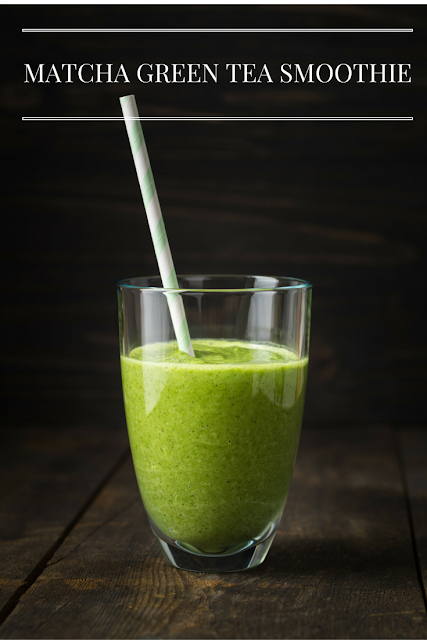 A simple, delicious and very healthy smoothie treat! I love treat smoothies. Thanks for sharing your recipe! I think my favorite smoothie is banana blueberry. It's just a frozen banana, some fresh blueberries, a splash of OJ, and crushed ice. Sometimes it's not sweet enough, so I add honey. We're big smoothie drinkers in my house, I cant believe I haven't tried a green tea version yet! Thank you so much for sharing. you had me at matcha, my favorite tea! I will be trying this recipe soon. Any sugar free matcha will do.